Get Ready for Capt. Richard Phillips Day! Captain Richard Phillips was rescued from Somali pirates, and he's proven to be an American hero. Now America's oldest baseball stadium is recognizing the brave captain. Boston Red Sox owner Tom Werner has personally invited Capt. Phillips to throw out the first pitch during a game at Fenway Park. Werner was so inspired by Phillips' story, he wants to have an official "Captain Richard Phillips Day" at Fenway. Werner sent Phillips a message via "Extra," saying, "I was so inspired like everyone else by your story... As the owner of the Red Sox, I'd like to invite you and your family to come to a Sox game. Throw out the first pitch. Maybe play third base for an inning. 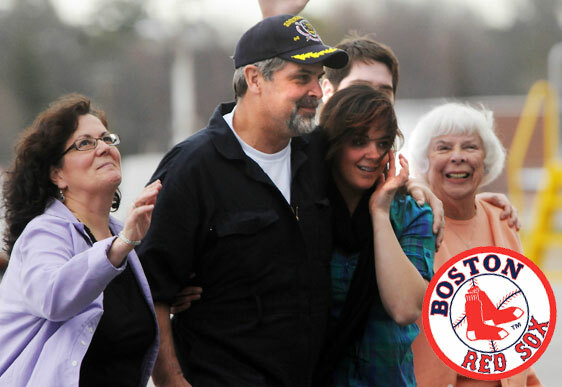 He continued, "We'll officially make it 'Captain Richard Phillips Day' at Fenway. And I want you to be my personal guest because you, Captain Phillips, are a true American hero." Captain Phillips was rescued on Easter Sunday when Navy Seal snipers killed the Somali pirates holding him hostage. The Captain and met his wife Andrea at Beantown's famed baseball stadium and married in 1987.